Before bidding a final farewell to life in China, my partner and I decided to embark on an whistle-stop tour through the South West Province of Yunnan, visiting Lijiang, Tiger Leaping Gorge, Zhongdian (renamed “Shangri-la“) and Kunming. The first stop on our tour was the ancient town of Lijiang. In ancient times, Lijiang was a communication hub for the Ancient Tea Horse Trail (also known as the southern silk road) and home to the Naxi people (纳西族). Today Lijiang is a premier tourist attraction in China, meaning millions of visitors and megaphone－toting Chinese tour guides descend upon it’s cobbled streets each year. While the souvenir shops, neon lights and pop-music piped into the streets does give the town a slight artificial feel, it’s still a highly worthwhile and photogenic destination that should feature on every China-traveller’s bucket list. Jade Dragon Snow Mountain in all its magnificence. This was a resident dog at our guesthouse. He was a cutie. You can climb to the top of Wangguolou for a great 360 degree view of the surrounding area. The old town is essentially a maze of twisty lanes, criss-crossed by small canals and bridges, with hundreds upon hundreds of ancient houses scattered and crammed in among them. Many of the guesthouses and cafes offer glorious views of the surrounding rooftops and the nearby Jade Dragon Snow Mountain yulong xueshan(玉龙雪山), which sits brooding in the background, wrapped in a blanket of snow, clouds and mist. One of the perks of Lijiang is sipping on coffee and losing yourself in the views. While in the town, you will hear this twee little song (called didadida by Chinese singer Kan kan) being played on a loop ALL DAY in all the shops, cafes and restaurants. No other song ever gets played. It pervades the centre of the town and makes you feel like you are in a theme park. At first it may seem pleasant, but you’ll soon want to rip your ears off. Strangely enough the song doesn’t seem to grate on the Chinese tourists at all – quite the opposite: they seem to adore this song and instantly accept it as the official Lijiang theme tune. Luckily it’s only the central part of Lijiang, close to the market square, that is like this. Once you break away from here and dart down a few side streets, you find empty peaceful alleyways devoid of didadida and crowds of tourists. The quiet side streets house a number of much quieter guesthouses, cafes and eateries, which are generally ignored by the throngs of tourists who traipse through Lijiang each day. Thermos flasks are important items in areas of China where hot water is only available at certain times of the day. 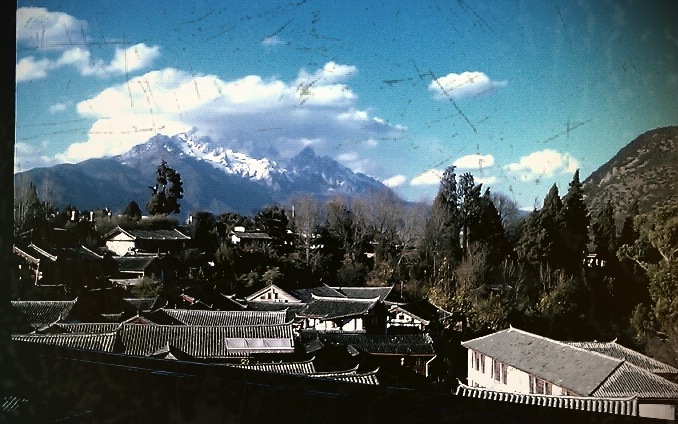 This is Lijiang, New Town. It’s just outside the perimeter of the old town. Don’t be fooled – this is one of the noisiest streets in the town. This is Xinhuajie. The bars, which are out of shot in the music, blare out music until the early hours of the morning. 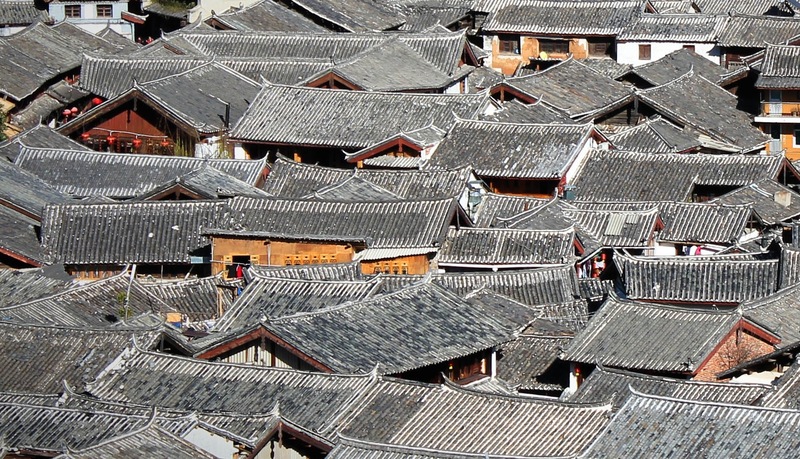 Exploring the backstreets is a great way to avoid the crowd and explore Lijiang. Once you’ve had your fill of exploring Lijiang and lounging about in cafes, you can head off to the Jade Dragon Snow Mountain, which is exactly what we did. If you can, go out of season. This generally means travelling between October and April, with exception of Chinese New Year (which was when we travelled), to avoid hordes of tourists. Drink as much Yunnan Aribica coffee as you can – believe it or not, Yunnan Province has the perfect conditions for growing fabulous coffee beans. Most of the cafes in the town serve up Yunnan coffee. Stay in a guesthouse well away from the bar street Xinhua jie . The bars on this street kick to life at 8pm, blaring various kinds of aurally displeasing music into the air and continue late into the night. It’s essentially a slice of Ibiza with Chinese characteristics. Our guesthouse was located very nearby, meaning we were often kept awake with noise and drunken revellers stumbling back to their guesthouse. It was pretty fun. The best villages and towns to visit are the ones slightly off the radar, like Cuandixia (near Beijing). It’s a little village nestled into the foot of the mountain range separating Beijing and Shanxi. Beautiful place (will do a post about it soon). Great way of escaping Beijing’s summer heat. That view of rooftops is stunning! Really would love to wander these little alleys. The clincher for me is the small streams running through the streets…this always adds such a lovely atmosphere (and sound) to a place. And, unlike the “health and safety” idiocy in the UK and other places, I love that they have simple planks of wood as bridges. Thanks for this post – inspirational. 😀 Thank you! Our trip around Yunnan was the nicest trip we’d taken in China and was a perfect way to round off our 4 years there.